Cotoneaster 'Juliette' is a semi-evergreen, low-growing shrub that we have grafted onto a clear stem allowing the long branches to weep down freely. The variegated leaves are small and dark green with pretty, white margins. Following the white flowers that emerge in June-July, a mass of eye-catching, orange/red berries are produced in the autumn. This variegated weeping Cotoneaster tree will grow to just 1.5 x 1 metres in 20 years making it ideal for small spaces or container growing. A tough tree, Juliette will tolerate exposed and coastal positions and thrives in well-drained soils with full sun or semi-shade. A very lovely tree, resilient enough to handle difficult positions. 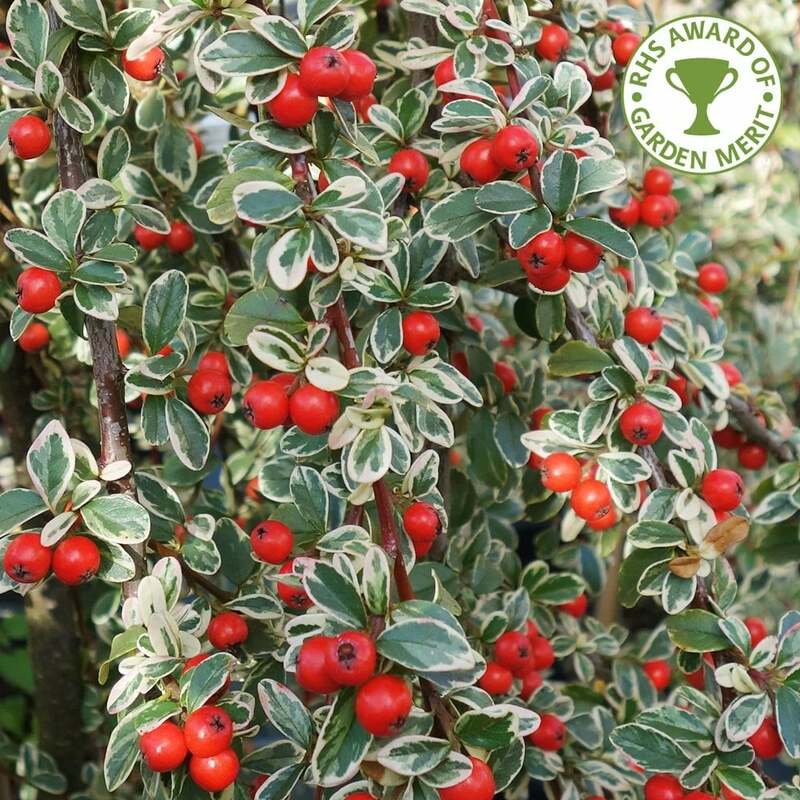 Our pot grown variegated weeping Cotoneaster tree can be planted at any time of the year. Start by removing weeds and grass within a metre of your desired planting hole. Dig a square hole as deep as your root mass and approximately 2x as wide. To help your tree establish more effectively, sprinkle root grow in the hole. If you’re planting in spring or summer, water well and regularly for the first few months. Make sure to keep an eye on young variegated weeping Cotoneaster trees and increase watering if there are extended periods of hot or dry weather. If you’re planting in autumn, you may only need to water your tree a little. We stock a range of irrigation kits, suitable for a variety of planting schemes.